Mario is going to have a super hard time riding Yoshi when he’s drunk! This creative wine stand makes it seem as though the green dinosaur has greedily taken an entire bottle for himself. He doesn’t seem too keen on sharing! Welcome to Pokemon biology 101! The book is 300 pages long and contains all of the original 151 Pokemon, with full page anatomical illustrations as well as detailed descriptions of their biology, behavior, and abilities. These unique cake toppers will add the perfect touch to any geeky couple’s special day. The adorable handmade pieces can each be customized to suit the groom and bride’s preferred Super Smash Bros characters. If you’re not already satisfied with the cuteness level of regular Pokemon plushies, check out these custom made dolls! These one of a kind Pokemon dolls are completely handmade with high quality faux fur and a fully posable wire skeleton. It’s dangerous to go out alone on an adventure without at least taking some potions with you. These handmade potions are labeled with a clean-cut printed sticker to perfectly the canvas designs seen in the Ocarina of Time. Who’s the one that makes sure you save your Pokedollars and helps set the day of the week? Show your appreciation to all the wonderful moms out there who deserve it so much with these geeky Pokemon Mother’s Day cards! If she can read this, marry her! This hilarious t-shirt utilizes the Pokemon world’s ancient alphabet to write a secret message only a Pokemon Master can decode. Creates a killer conversation starter and guaranteed to get some giggles from Pokemon fans! 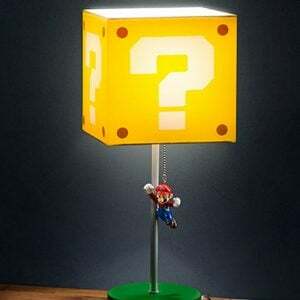 Brighten up your life and bring some childhood whimsy to your work space with this Super Mario Question Block lamp! While it may not contain coins or magical mushrooms, when you pull Mario down and release him up to punch, the light will turn on. Mario went to the wrong castle. AGAIN? Express the frustration of every Nintendo player in the 80’s with this hilarious t-shirt. Inspired by the classic cut scene and quote from Toad in the original Super Mario Bros game.